The notion of the Obama regime supporting free speech, particularly in journalism or on the internet is dubious, at best, since this is the same administration that has a Department of Homeland Security responsible for shutting down dozens of websites and other agencies installed as “Super Flaggers” on YouTube to target videos and even whole channels, such as Mark Dice’s anti-Illuminati channel for censorship. Surely Chinese students are smart enough to know when they’re being handed a pack of lies, as in this case. Michelle Obama’s suggestion that her husband’s presidency supports freedom of speech is at odds with the insistence by long-time democrat Dianne Feinstein that the government should have the ability to define who is a ‘real journalist’ covered by freedom of the press, for example. We do Michelle, we do criticize and question our political leaders, you idiot! 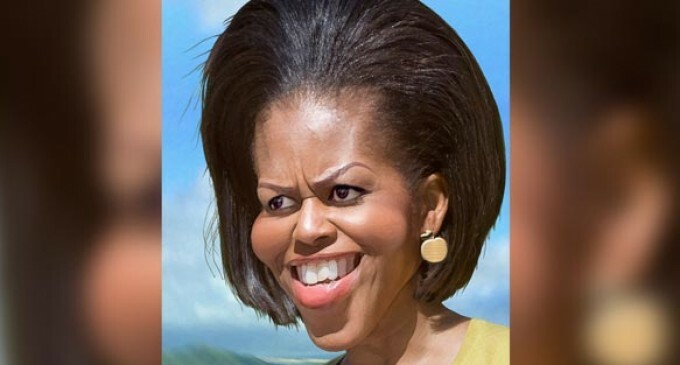 the scariest part is, I see this every time I look at her…. I like her new look, it suits her personality. she is ugly enough without the caricature! How can anyone be a racist against them? people forget along with them, they are not totally black they’re black and white and two faced. And leading the way to destroy our country as we knew it.